I love to have cake, but not an entire cake as it sits out and can dry out before you eat it. And then I met this delicious chocolate mug cake. More cake than a cupcake and it’s all mine! This is a easy recipe that you can make in about 5 minutes. You can frost it with the fluffy cocoa frosting recipe, or I just add some whip cream (I prefer whipped cream from a can) on top and let the kids devour it. Or eat keep it for yourself. You don’t HAVE to remove it from the mug you can eat it right from the cup if you want. Who knew there could be so much yum in a coffee cup! And if you make little cakes like this, think of the different things you can frost them to make cute little cakes like bee hives, dots (the candy), castles and more! Spray Pam in the mug so it won’t stick. Pour in milk, chocolate syrup, oil and vanilla, mix well. With a 1200 watt microwave, cook for 4 to 6 minutes. Cake may rise over top of mug–do not be alarmed! Ohhhh….that really is way too easy! I almost think I should forget I saw this. Almost. 🙂 It can be dangerous. I made it a few times the past few days to get it to the chocolate consistency I liked. So it is to easy. Just hide the recipe in your cookbook. Yum! This looks so, so good! Thanks for sharing the recipe! Oh boy! It’s scary how fast and easy this chocolate cake can be made! I guess that’s why they call it Dangerous. Thanks so much for passing this on. It is easy. Maybe a great treat for the kids coming home from school or last minute guests. Oh, that looks incredibly yummy! My daughter will love that for sure. My kids love it with ice cream! I made one of these using raw cacao and coconut milk just the other day… it was delicious! I like how you aren’t tempted to eat MORE because they are in single serving containers. Oh that sounds delicious too! I love coconut! This sounds delicious! I love how easy it is to make. I love mug cakes and am quite a good baker but I have to be honest, I thought this cake was pretty gross and VERY eggy. Also, you can get way better taste with way less calories with lots of other recipes. 3 tablespoons of oil seems excessive. I love the idea, but the end result will not be something I’ll try again. Sorry you had a bad experience. 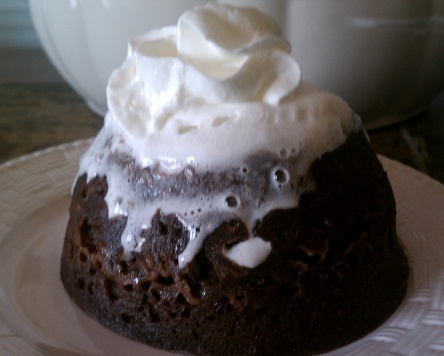 You can always take a box cake, mix and put 1/4 of the material in a mug and microwave it too. That way you’ve got 4 cups of cake when you want. This recipe was way too wet for me. I wound end up cooking it in my 1100 watt microwave for 5 minutes and it never dried out so I don’t know what I did wrong but it didn’t work out for me. Sorry to hear. With the different microwave wattage, you will need to adjust the amount of time for your microwave. Cocoa powder does not contain sugar. I believe nesquick does. If you make it with nesquick, you may get a different result.